Miss Colorado did not take home the crown on Sunday night, but her talent was certainly memorable. She emerged on stage in her nurse scrubs, talking about her career. Her story getting a lot of traction on social media, not because of what Kelley Johnson said on stage, but rather because of what the hosts of "The View" said about her . “(She) came in a nurse's uniform, and basically read e-mails out loud (laughing). And shockingly did not win," said The View co-host Michelle Collins. "Why does she have a doctor's stethoscope around her neck?" questioned co-host, Joy Behar. Johnson’s talent stole the show, a simple monologue about being a nurse and caring for Alzheimer’s patients. She goes on, "I'm never going to be just a nurse (cheers)." So touching, The Alzheimer's Association tweeting, "Thank you, @missamericaco." The View’s Facebook page is blowing up. "How about posting an apology for your rude comments about nurses? ?," a viewer posted. "It's a shame you have no respect for one of the most important and already under-appreciated professions in the world," said another. "The hosts of The View wish they collectively had enough brains to be a nurse," another person on Facebook commented. 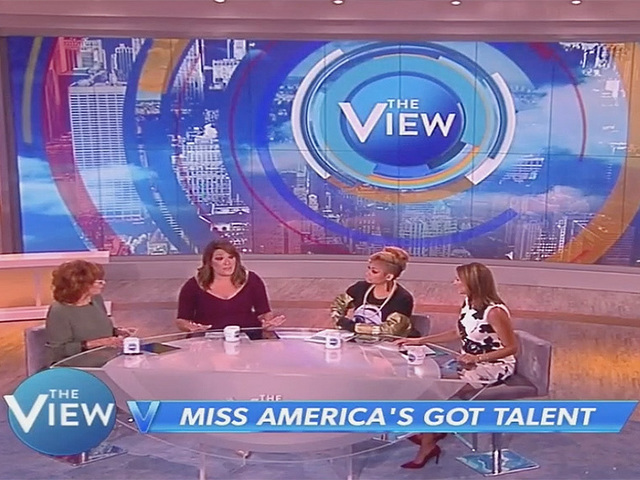 Despite several Facebook posts asking The View hosts to apologize for the joke, no comment has been made as of Tuesday night.